I love finding new recipes to try. I love trying new recipes when I have people over for dinner (maybe a little risky, but I do it any way). 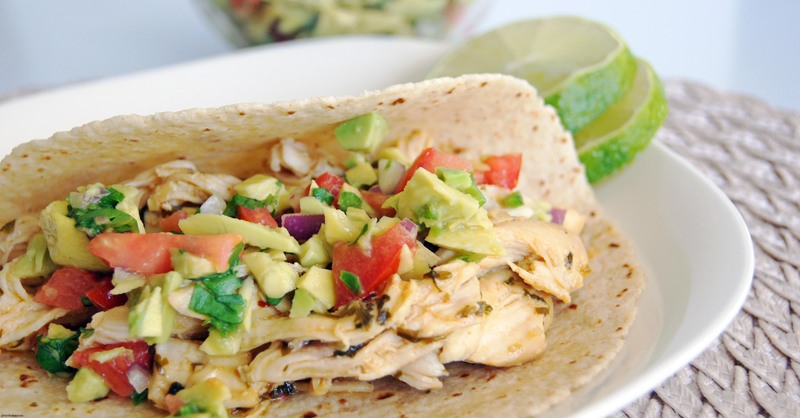 What I love most is when those recipes turn out to be amazing, like these tacos for instance. I definitely found a winner here — we absolutely loved these tacos. We ate every last bite. I was so sad I didn’t have any left over for lunch the next day. My sister stopped by my house the night I made them and I had her try one. She couldn’t stop raving about them. She told me it was the best taco she had ever had and it tasted like it came from a restaurant. I guess she loved it so much she told our sister Lori about them. Lori called me later that night asking for the recipe and told me Tasha couldn’t stop raving about them. I can’t wait to make these again. Honestly, they really were amazing. I definitely hit a home run with these. Heat a large skillet over medium heat. Melt the butter. Add the garlic clove and minced chipotle chiles and cook for about 30 seconds. Add the orange juice, 1/2 cup minced cilantro and Worcestershire; stir well. Add the chicken breasts and simmer, covered, for 6-7 minutes on each side. Remove chicken, cover with foil and set aside to rest for a few minutes. Continue heating the sauce and reduce to a glaze. Add 1/2 tsp. of yellow mustard (this helps emulsify it) and stir well. Shred the chicken and add back to the glaze; toss to coat. Stir in 1/4 cup of chopped cilantro. Mash two of the avocados with a fork, fold in the remaining ingredients. I think the homemade guacamole took these tacos up another notch. So if you have the time, I would definitely make some. Just make sure your avocados are ripe enough. Mine weren't and wouldn't smash up, so I just left them diced. On a scale of 1 to 10, these tacos are a 12! They immediately made my “favorites” list! I agree with Lori. Best taco’s I’ve ever had. So glad I came over that night.